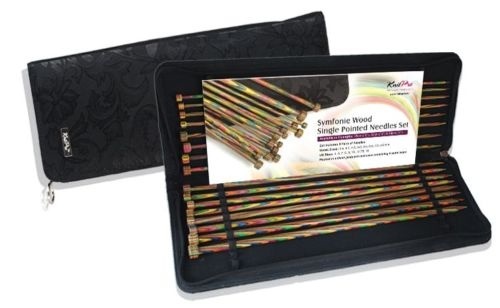 KnitPro Symfonie Wood Single Pointed Knitting Needle Set 25cm.<br> Set of 8 pairs of the most popular sized single pointed needles<br> Extremely Attractive Colour Pattern/Combination<br> Lightweight, yet exceptionally strong & durable<br> Polished warm wood surface works effortlessly with every type of yarn without slowing down knitting rhythm.<br> Packaged in an elegant black jacquard fabric case<br> The knitter’s favorite needle: Providing hours of pleasurable knitting with no hand fatigue. KnitPro Symfonie Wood Single Pointed Knitting Needle Set 25cm. The knitter�s favorite needle: Providing hours of pleasurable knitting with no hand fatigue.